Valentine’s Day is just a couple short days away and if your kiddos still need to get their Valentines ready I’ve got some adorable printable Pocoyo Valentine’s Day cards to share with you featuring Pocoyo, Elly, Pato and Loula! Enjoy! Happy Valentine’s Day everyone! Following the adventures of Pocoyo, the CGI series brings children into the bright world of an inquisitive and fun-loving boy and his animal friends, Elly (the elephant), Pato (the duck) and Loula (the dog). 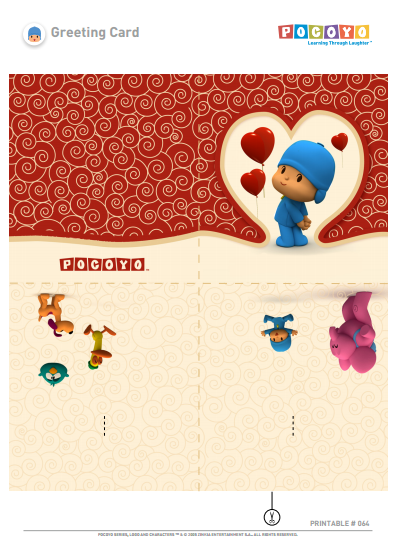 I’m not familiar with Pocoyo, but these Valentine’s Day cards are adorable! Since they really don’t say anything about Valentine’s Day (except for the heart balloons featured in each one), you can probably use them as everyday cards for kids…just to show them you love them! That’s a great idea Kim! Love it!